IRS scandal: Tea Party rallies GOP lawmakers. U.S. Rep. Michele Bachmann (R-MN) speaks at a news conference with Tea Party leaders and congressional members to discuss the IRS scandal of targeting the Tea Party on May 16, 2013 in Washington, DC. It was just like old times. 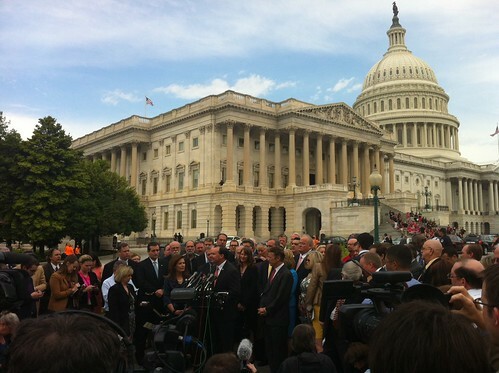 Rep. Michele Bachmann was at the front of a Tea Party rally, in front of the Capitol, flanked by Republican members of Congress. What began as a Bachmann + activists event led off with a speech from Mitch McConnell, reiterating his outraged floor statements about encroaching government power. The IRS/AP/Benghazi scandal casserole had, according to Utah Sen. Mike Lee, “confirmed our worst fears” about government power and overreach. “It is indicative of a pattern in this administration,” said Texas Sen. Ted Cruz, “a willingness to use the machinery of government for Chicago-style politics.” Cruz drew the media’s attention to a possible scandal: The IRS had gone so far overboard that it had leaked damaging tax documents to the Obama campaign. When he left, reporters asked him exactly what he was referring to.